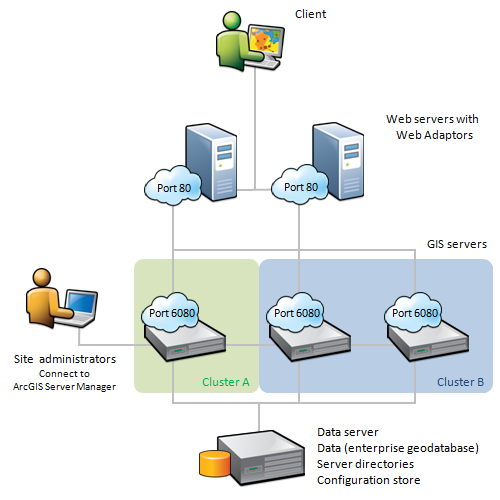 We have distributed architecture in arcgis as shown in attached image now can we create same architecture in 10.1. In 10 have you HA on web server? Because in this configuration (10.1) you have HA on web server. In 10.1 you haven't som. Thanks for your reply. Since we have now 10.2 is the same applicable to current version of Arcgis server. What do you mean by HA and where is network load balancer? Do we require still only two licences of arcgis server and same time we are using power of four machines? Do you recommend any new architecture? "HA" means High Availability. At the 10.2 version of ArcGIS for Server, the Site load balances itself. There isn't really a need for a separate load balancer anymore, although there may be one or two specific use cases that are not common in most environments. You should know that ArcGIS for Server's licensing model is by the CPU core; so for every machine that runs a SOC instance you would require licensing on all of its cores. I suppose this would be a function of how many servers you add to your ArcGIS for Server Site.